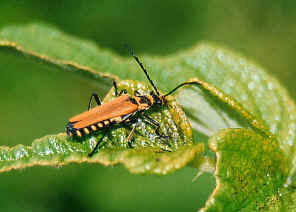 [JUNE 19, 2006] For those of us with linden trees, that are now pollinating, we probably have seen the soldier beetles. They look like pale lightning bugs, without the light. Following is some in-depth information on the beetles to give us a little clearer picture of what they do. Soldier beetles, also known as leatherwings, get their name from the soft, clothlike wing covers, which when brightly colored are reminiscent of uniforms. These beetles are elongate, soft-bodied and about 1/2 inch long. Colors of soldier beetles vary from yellow to red with brown or black wings or trim. A common and easily spotted species is the Pennsylvania leatherwing, which is yellow with one large black spot on each wing. Soldier beetles resemble lightning bugs but do not have light-producing organs. Another group of beetles that may be confused with soldier beetles are the blister beetles, which are pests, but blister beetles have a square-shaped head and a very visible "neck." Adult females lay their eggs in clusters in the soil. The larvae are velvety, covered with dense bristles, and have antennalike projections on their head. Most larvae are carnivorous, feeding on insects in the soil. Larvae overwinter in damp soil and debris or loose bark. The adults are also predators, eating caterpillars, eggs, aphids, and other soft-bodied insects. They will alternatively eat nectar and pollen if no insects are around. They do not damage plant foliage. Adults are often found on flowers such as goldenrod, where they lie in wait for prey, feed on pollen and mate. Since soldier beetles are beneficial, it is inadvisable to kill them. They may be a nuisance in the fall, if large numbers of larvae enter a house in search of a place to overwinter. They are also a major pest this time of year when populations congregate around those linden trees. Weather-stripping and caulking will pest-proof a home. A vacuum cleaner will safely remove soldier beetles that are found inside. This is one of those infamous "things you could work on in your spare time" lists. Of course the list is endless, but as time and mood allow you could work on a few of these things. Pruning evergreens is done about the end of June. This applies to both broadleaf and traditional evergreens. Pine, juniper, yew, arborvitae, spruce, holly, rhododendron, azalea, and other evergreens should all be pruned around the end of June. This keeps new growth from getting too rank this growing season, but still allows new growth that does occur to harden off before the cold month this fall and winter. Pruning can be done for shaping or size containment. Check tomato plants for signs of septoria leaf blight. If you see brown areas between the veins and along tips of leaves, especially on the lower leaves, you may want to start a fungicide spray program. This is the disease that has caused leaves to drop off of plants the last couple of years, and it is present very early again this year. Fungicides such as mancozeb, maneb, or Daconil will have provide some control of the fungus. Also on tomato plants, if you haven't mulched them yet you may want to do so. The mulch evens out soil temperature and moisture. This is a great assistance when preventing blossom end rot on the fruits as they begin to form. You may use straw, grass clippings, or any commercial mulch material. Apply about four inches deep and hopefully this will help prevent those leathery bottom tomatoes. Keep spraying, or dusting, cucurbits and potatoes. Different things on each, but the potato leaf hopper populations have increased and the beetles that transmit the wilts on cucurbits are present. Sevin and diazinon are the mainstays for these programs. Japanese beetles are emerging. Protect your favorite roses or apple tree with a cover spray of permethrin or Sevin liquid. They are just starting, so keep an eye on them. 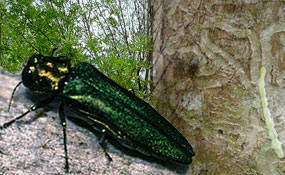 Emerald ash borer is in Illinois. Northeastern Illinois to be exact. This doesn't mean it isn't other places, since they didn't know it was in Kane County for several years. If you're concerned, go through a simple checklist. Make sure the tree you think is infected is an ash (blue, green, black, or white). The infected tree will have dead branches at the top and at the ends of major branches. After a period of years, you will see the D-shaped exit holes. There are other ash borers that have been with us, and they have O-shaped exit holes (they aren't flat on one side). If you suspect emerald ash borer, call the office and we can check it out.